Piso Fare 2019 Promos Until 2020: Piso Fare For May 2015, No? Piso Fare Promo 2015: Don't get disappointed if there is no PISO FARE yet from Cebu Pacific. 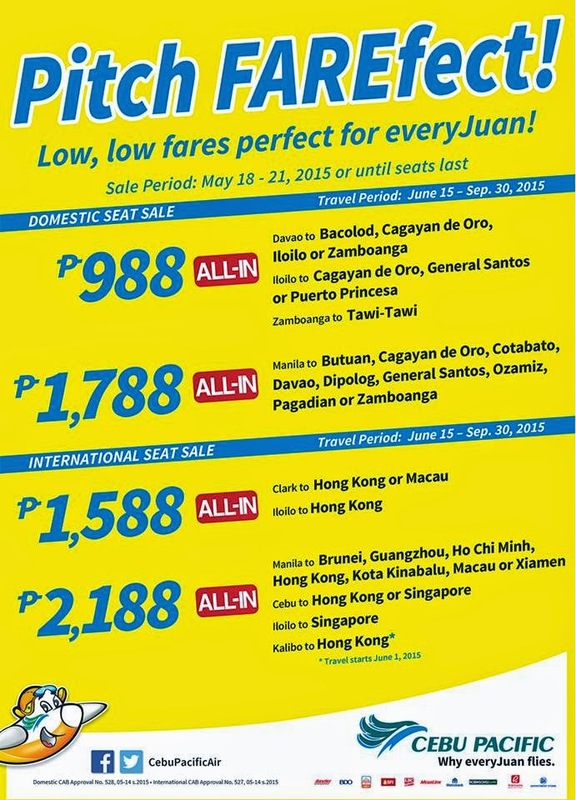 You can avail these perfectly low fares now! Just check with the travel period. There is a domestic seat sale that you can avail. Planning to visit some parts of Mindanao? It's definitely safe!!! Do check out yourself. Have fun traveling. Quoted fares are valid for one-way travel only, inclusive of 7 kg hand carry baggage allowance, base fare, web admin fee and taxes collected at point-of-sale. International Terminal Fees for non- Manila Stations and Php 1620 international Travel Tax must be paid at the airport. Promo fares have limited availability and are non-refundable but rebookable subject to the following rebooking fees: Php 1,200 for Domestic destinations and PhP 2,000 for Short-haul International destinations plus fare difference. For your convenience, flight changes, availing of prepaid baggage allowance for check-in baggage and web check-in service can be done up to 4 hours before scheduled flight.